We are coffee snobs. The closest thing to a religion for us is the morning ceremony. No matter where we are, we begin the morning by freshly grinding our coffee beans and brewing up a fresh tall cup of our favorite coffee sipped from a Bodum double-wall glass. The secret is Freeze the Beans! The ritual begins by setting up everything we need. First out and first on is our Bonavita digital programmable kettle. Water to 186º F from our GE filtration system. Then we grab the frozen bag of Meaning of Life from our Italian roaster Cafe d’Arte in Seattle and manually grind the beans using a Hario ceramic coffee mill. The secret is using an Aeropress from our geek friends at Aerobie the flying disk company from Palo Alto Ca. Pouring in the water and stirring constantly until the spoon is clean of grounds. Top it off with water and put the plunger in waiting for 4 minutes precisely. Then a slow even plunge which fill the cup 2/3rds full. Top with hot water and enjoy. 4 minutes of anticipation. Most coffee snobs know that once you open a foil bag of coffee, you should freeze your beans to preserve the oils and flavor. What only a hand full of snobs know is that when you freeze your beans, the oils thicken and the coffee grind is much more fine and uniform. The beans do not crack when you grind and the grind is almost perfectly even and the same size. The temperature of the water is incredibly important and is different depending on the roast you choose. For example, Firenza from Cafe D’Arte wants to be at 205º while Meaning of Life needs to be at ~186º. 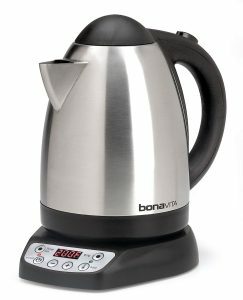 So, a digital programmable kettle is imperative and our Bonavita is accurate to 0.25º. 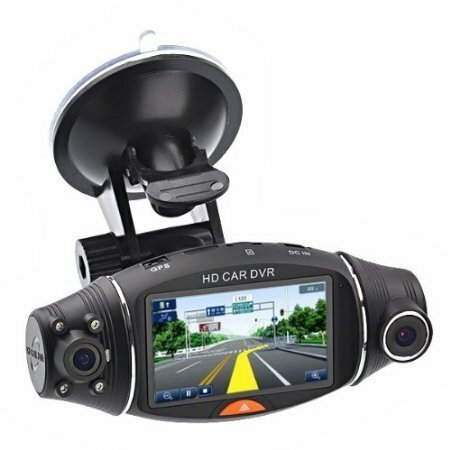 It sells for $75 on Amazon. Did I mention we are snobs! The Hario hand grinder has a ceramic burr mechanism. It is a hand grinder, because electric ones are too fast and take up too much room for us. 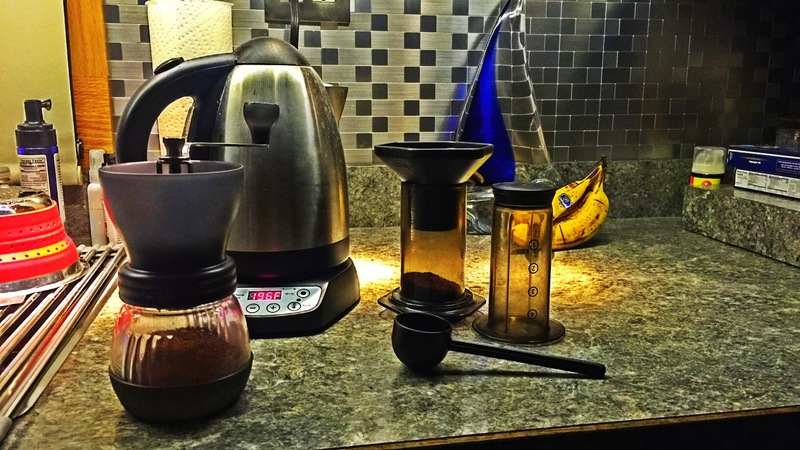 A slow manual grind assures as much an even grind as does freezing your beans. The slow grind powered by a human also adds to the ambiance of the process. The slow grind smells wonderful and the sound is mellow and acts as a sort of welcoming alarm clock for the person still in bed. Yes, almost a religion. 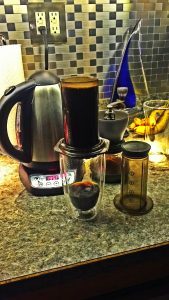 We have tried virtually every type of coffee brew system and the Aeropress is hands down better then anything else. It was developed by our geeky friends at Aerobie the flying disc company based out of Palo Alto Ca. As the story goes, they were working on a new concept for a flying disc and one of the people ran out to buy coffee. It was so good that they wondered what was different. Further investigation uncovered that the coffee maker was a very expensive Italian plunger system that force the water through fine ground espresso coffee with a fine mesh filter. They though if they would create a plunger that resembled a syringe and a filter system to trap the grounds that they could duplicate the effect. Experts at moulding plastic, it was a snap to design and we were introduced to it at a trade show in Las Vegas. Never looking back. We added a fine wire mesh filter so that the oils would come through instead of being trapped by the paper filter. 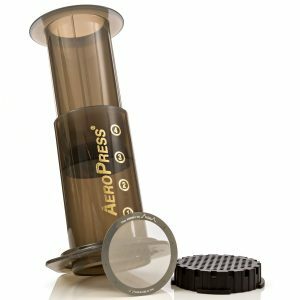 The Aeropress is ~$30 on Amazon and the mesh filter about $15. Keeping track? Yes, already more then a Mr. Coffee! Our friend Chef Traci, in Seattle, introduced us to Cafe D’Arte many years ago and we are still loyal fans. We have it shipped into us wherever we are with enough backup to assure we never run out. Our favorite is “Meaning of Life.” Aptly named, it is not quite an espresso, is full bodies and dark. It is triple cracked which means that it is roasted three times to create the dark flavor. We brew it hard in the Aeropress and fill the remaining room in the glass, making this an Americano brew. The glass adds the final touch. A ceramic coffee mug from some promotional company stained with coffee does not cut it if you are going to go all the way. We use the Bodum Pavina 15 ounce double wall glasses. Very neat and insulated. The double wall of glass keeps the coffee at the right temperature while the outside wall is room temperature. About $30 bucks for two on Amazon. Every day we follow our ritual and yes it is a religious experience for us. The bad news is that it is nearly impossible to have coffee out. Sometimes we find a local cafe with one of the Italian plunger machines and it is a delight. 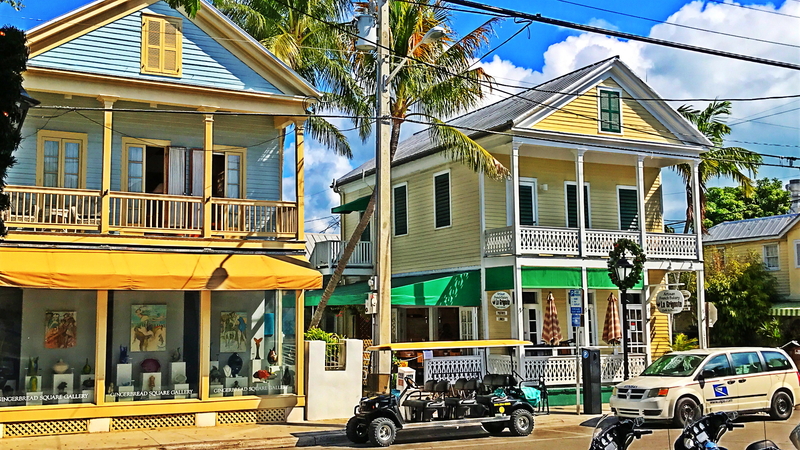 …and no, Charbucks is not one of our places. My friend Kathleen fro Venice CA quickly reminded me of the bulletproof trend for coffe meant to supercharge your brain, lose weight and lower blood sugar levels. BAsically the idea is to add a grass fed butter, MCT (medium chain triglyceride) or raw coconut oil to your coffe and blend it on high until it is a froth. It is actually quite good and the effects/benefits are positive…if you are a westerner and negative if you are living in the east. I personally feel that it is good for you and tastes good. The problem for most is finding a MCT? now products sells a MCT that you can buy or order online or at high end health food store. Personally, I like Kerry Gold Irish unsalted or salted on occasion, but I am such a black coffe purist.